OK, this is something you probably don’t want to do at home. At least not with a rifle that belongs to you. You’ll find the video on PROOF Research’s website (www.proofresearch.com). Company engineers fire a group with a 6.5mm Creedmoor rifle. Then they unscrew the barrel, attach a thread protector and use the barrel to beat a cinder block into, well, cinders. Then they unscrew the thread protector, screw the barrel back into the action and fire another group. This second group is about the same size as the first, no more than an inch. And, although the point of impact shifts maybe an inch and a half, I guess they can be somewhat forgiven. A typical rifle barrel is a fairly stout piece of steel, and a cinder block is just cement, so I guess there’s no great mystery about which should yield. Except that the PROOF Research barrel isn’t all steel. It’s carbon fiber reinforcement (wrapping, if you will) around a steel barrel that has been turned down to pencil diameter. This is certainly not new, but PROOF Research, based in Whitefish, Montana, is a new company doing it with a patented process. Since carbon-reinforced barrels aren’t new, those of us who have barrels of this type that have seen rough use know that if you work at it, barrels of this type will scratch, scuff and nick. So questions about their sturdiness and durability are natural. But up until now it never occurred to me to beat a cement block to death to prove the point. Again, this is not a new concept, although PROOF Research is doing it differently than it has been done before. Carbon is lighter than steel, so in part, it’s a way to reduce overall gun weight. But there’s a bit more to it than that. The carbon reinforcement aids in heat dissipation and also reduces the barrel’s natural tendency to warp as it heats up. So here’s the deal: A carbon fiber-reinforced barrel may — or may not — be any lighter than a slender steel barrel. In fact, it may be heavier, depending on how much unreinforced steel you’re willing to do without. But we all know that there’s a trade-off. A really slender steel barrel may be capable of groups every bit as good as a very heavy bull barrel on a varmint or target rifle. However, pencil-thin barrels are likely to be more finicky in the loads they will group well. More critical yet is how many shots you can fire before the barrel overheats and the group starts to wander. When I was a kid — and a junior editor at this magazine — we used to rely on five-shot groups as the accuracy standard. But I guess over the years we got lazy. It’s a lot easier to hold a three-shot group than a five-shot group, and we excuse that by saying that the average of five three-shot groups is as statistically representative as three five-shot groups. This is absolutely true, but, aside from laziness and perhaps ineptness in our benchrest technique, light weight is the “in” thing when it comes to sporting rifles. Synthetic stocks are generally (not always) lighter than walnut. But steel is heavier than wood or synthetic stock materials, so the quickest way to remove gun weight is to remove steel, and the barrel is the easiest place to do that. The result is that the average sporter barrel today is both shorter and thinner than it was when I started at “G&A” nearly 35 years ago. At the range, this means that we spend a lot more time waiting for barrels to cool than we used to, but, practically, the truth is that some very good pencil-thin sporter barrels are capable of incredible groups — if you’re willing to wait 20 minutes between shots. This is not necessarily a practical exercise. 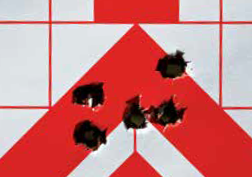 If you need a second or third (or fifth or sixth) shot in the field, you may not have 20 minutes to wait, but the reality is that a lot of light sporter barrels are not capable of holding a five-shot group without barrel heat causing the bullets to walk. Quite a few of them in my experience aren’t capable of holding more than two shots without starting to walk. OK, sure, in most hunting situations one shot is enough and two is plenty, but if you see any of that as a drawback or impediment to the shooting you want to do, then a carbon fiber-reinforced barrel will solve that problem. It looks like a bull barrel and has the shot-to-shot stability of a bull barrel but with the weight of a much thinner sporter-weight barrel. 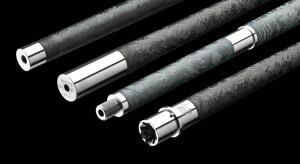 There is also a cool factor: The carbon fiber can have myriad patterns or be dipped in any camouflage desired. To my knowledge, Utah’s Christensen Arms was the first to bring this type of barrel to market, and I’ve had excellent results with them. PROOF Research is a fairly new kid on the block, but their carbon-reinforcement process is both proprietary and patented — and it works. Like many companies today, PROOF Research operates in both the tactical and sporting arenas. I’ve seen and shot samples from both worlds, although I haven’t personally used the company’s barrels to pound cinder blocks. My wife, Donna, and I have a left-hand .338 coming that we’ll start out — and share — on a spring bear hunt, but I wanted to get one of PROOF’s rifles in the field as soon as possible, so I settled for a right-hand 7mm-08 on a Jense action, a nice, short, light rifle on one of the company’s synthetic stocks. Accuracy was very good, and this was a rifle that easily stood up to five-shot groups. It performed extremely well with Barnes Vortex 140-grain TSX, equally well with Hornady GMX and pretty much the same with Hornady’s American Whitetail 139-grain InterLock. 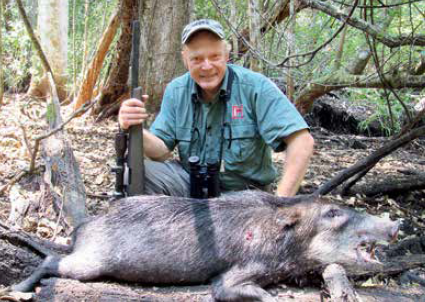 It was that last load that I used when I took the rifle to the jungle of the Yucatan Peninsula to hunt White-lipped peccary. The White-lipped peccary is a relative of the collared peccary or javelina that ranges in thick cover from southern Mexico to northern Argentina. This is a very big one. This is a little unusual. Shotguns with buckshot are preferred for the close-cover hunting done down there, but this was the third time I’d tried for this larger, jungle dwelling relative of the javelina, and I wanted all my bases covered. So, honestly, when we waited at waterholes or along trails, I had both the rifle and shotgun at hand. The shot that I drew couldn’t have been made with buckshot. The distance was questionable, but regardless of that, there was just too much brush in the way. A small group of peccaries had come in on the far side of a waterhole. I could see just the distinctive white snouts in the shadows. There was no chance for a shot, but they started working their way around toward us. That was good, but the wind was swirling slightly, so I didn’t think we could let them walk onto us. As they approached, I picked out what looked like the biggest one, and at about 50 yards I was pretty sure I had a small but clear window to the shoulder. I must have been right, because the animal dropped to the shot. He was not only one of few White-lipped peccaries taken with a rifle but, by skull measurement, quite a lot bigger than any recorded. That’s a pretty auspicious start for a new rifle, but I can’t wait to get my hands on one with a left-hand action.